Asian toy maker Hot Toys has just sent us 15 new photos of the proposed Silk Spectre II action figure — and she looks hot! This Silk Spectre II figure stands approximately 30cm tall and features more than 26 points of articulation. The figure will also be dressed in her movie accurate black and yellow hero costume complete with with garters, black thigh-high boot tops, long black gloves, belt, and interchangeable trench coat. 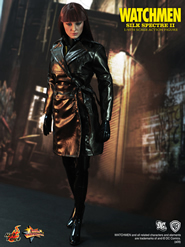 The figure also boasts a highly detailed head sculpt with implant hair and the authentic likeness of Malin Akerman as Silk Spectre II, one pair of interchangeable gloved hands, and a 12 inch figure stand with a Silk Spectre II nameplate. We contacted our sources over at DC Direct for more on this action figure release, but was told there is no other official information available about the product line at this time. Another unnamed source who works close to the toy industry speculates that due to the lackluster success of the Watchmen movie, there's a good chance the entire series of principal characters may not make it to retailers. Although price information has not been released yet, be prepared to pay between $150 to $175 for these bad boys as that is the going rate for similar figures that were previously released for The Dark Knight and Hellboy. For those of you who just can't wait for (or can't afford) these high-end figures, head on over to the action figures page on this site to get a hold of all of the currently released DC Direct figures, which, though aren't as detailed as their Hot Toys counterparts, still look really good and also cost a whole lot less.